In my lifelong attempt to purge crap from my life and slim down our possessions, I recently trashed a dusty box of cracked cassette tapes. To be fair, most of the tapes weren't "crap." At least, not the mix tapes. As I sat beating back dust bunnies and scanning the handwritten tracks, I was suffused with memories and rushes of affection for my high school friends. Going through the mixes, I realized how much of my various friends' personalities were stuck in those tapes. Take Suzanne, for instance. See, I'm music-stupid. I always have been music-stupid. My contemporary music purchasing stems from having heard the song on an Apple commercial and allowing iTunes to suggest other music I might like based on those uninspired purchases. Back in high school, I relied on Suzanne to tell me what music was cool. Suzanne was my friend who subscribed to Rolling Stone, went to shows at First Ave., and could correctly pronounce "Siouxie and the Banshees." As a consequence, the mixes from Suzanne are filled with songs that were gently cutting edge. Like, she didn't want to scare me off by filling her mixes with Jane's Addiction or Cocteau Twins, but she wanted to elevate me from Top 40s radio fare to something a little closer to her tastes. Here's a representative mix from Suzanne, ca. 1991. Do you see how she mixed in Concrete Blond and Cowboy Junkies with more popular songs like, "In Your Eyes" and Seal's "Crazy"? Also, she knew I liked Prince, so she snuck in some lesser-known pieces, along with familiar stuff from U2, my favorite group. Reconstructing one of Suzer's mix tapes in particular wasn't easy, because at some point I had managed to spill something wet all over the liner. It totally obliterated the artists, and I found myself emailing Suzer last year asking, "Remember that mix tape you made about 15 years ago? Do you remember who sang 'Heroine'?" Now, Anna made our group of girls a tape when we were all going off to college. Her mix, which combines some awesome opposites, is about the good times we had -- I still remember her and Suzanne doing their "Housequake" moves at school dances -- and the melancholy of parting, combined with what new adventures we'd all be having. I can't ever hear "Bookends," "Homeward Bound," or "Minutes to Memories" without picturing my desk in the dorm, the tape playing in my boom box, as I wrestled with exams and this new thing called "email." 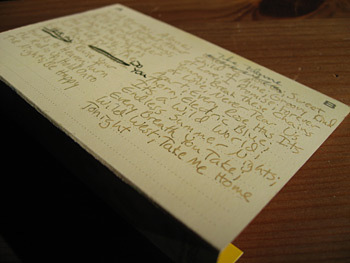 Laura, a friend I've known since pre-school, made me a high school mix that has been harder to duplicate. For one thing, she (like me) didn't always know the names of the songs and just used the first lines instead. Like, she lists "What Does it Take" by Honeymoon Suite as "If I Could Grow Wings." Usually, an Internet search bridges the gap, but the popularly-titled song, "Wild Horses," stymied me until I could finally recall some of the lyrics, which in turn, led me to Gino Vanelli. Now, that's a name I don't ever recall knowing in my entire life. I've also had a hard time finding all the songs I need. Seriously, Internet? What's up with not having IceHouse's "Electric Blue," and Peter Cetera's "I Wasn't the One (Who Said Goodbye)"?! Meanwhile, as I look at the songs my quiet friend chose to put on this mix, I'm suddenly struck by the wild theme. We've got "Wild Horses," "It's a Wild World" (by Maxi Priest, not Cat Stevens), and Escape Club's "Wild West." 15 years later, and I'm analyzing this. When he was my fiancé, Dr. Mathra gave me the only mix tape he's ever made for me. It's stuffed with Hendrix and some awesome Bob Dylan songs, but also introduced me to Fishbone, Luna, and Arrested Development. To this day, I consider "If Not For You" the most romantic song in the world, and I tear up every time I listen to it. We may have danced to "A Nightingale Sang in Berkeley Square" at our wedding, but that Dylan song captures our relationship. Luckily, I can remake that mix entirely from Dr. Mathra's CD collection without resorting to iTunes or Amazon. Finally, embarrassingly, wonderfully, there's "The Greatest Tape Ever Made." All the tracks are transcribed in a different pastel color from a rotating click pen I had. We've got lavender, electric blue, fuchsia, and neon green going on in true high school girl fashion. The mix begins with Chicago's "You're the Inspiration," and ends with "Wonderful Tonight." I'm about to crawl under the couch in embarrassment as I write this, but we made that tape specifically for a party we threw at Nicole's house. It was on her deck, where her family's seafoam green Weber Kettle grill was greatly admired, and if I recall correctly, we served five different kinds of chips, pop, and mounds of Twizzlers. We made that tape because certain BOYS were invited to that party and, I don't know, we thought the songs would be so influential that they'd want to DANCE or something? Or that they'd listen really hard to the lyrics and fall in love with us? I'm pretty sure it was a combo of those things. Another thing I remember was Suzer vainly lobbying us to put U2's cover of "Unchained Melody" on the mix, rather than the classic and Ghost-goosed Righteous Brothers' version. She firmly believed (believes?) that it was the superior recording, and one that happens to have made an appearance on a mix she made me in college. Another embarrassing admission -- but in a different, sweeter way -- is another manifestation of our addiction to "You're the Inspiration." Nicole and I had a ritual of sitting in my car where we'd blast the Chicago song and sing along at the top of our lungs to get "psyched up" before a dance. The mixes Nicole and I made for each other elevated "sentimental" to vertigo-inducing new heights. I Was Only Dreaming, O.M.D. One thing about all these mixes -- embarrassing or not -- is that I always know which song is supposed to follow the last played. The familiar grooves worn into my brain by way of magnetic tape are now preserved by mp3s. Of course the very best thing about these mixes is how each one reminds me of the people and personalities behind it, and I'm glad that I will never lose the remembrances that Tori Amos, Phil Collins, Bob Dylan, and Aerosmith keep alive and fresh.